From their birth through to their death, cells lead an eventful existence. Thanks to single-cell genomics, their destiny in large cell populations can now be analyzed. However, this method destroys the cell, which makes it difficult to draw conclusions about the dynamics of cell development. In order to address this problem, researchers at the Helmholtz Zentrum München and the University of Massachusetts use pseudodynamics, a mathematical model that estimates developmental processes from single-cell time series observations. Their report has been published in Nature Biotechnology. In their nucleus, stem cells carry the DNA that is the blueprint for any organ or tissue. They are thus able to give rise to various cell types, such as skin cells or blood-forming cells. Depending on their type, the newly created cells perform specific tasks in the body. They proliferate, mature, age and finally die through apoptosis. "We asked ourselves two questions," explains Prof. Fabian Theis, Director of the Institute of Computational Biology (ICB), Helmholtz Zentrum München and Professor of Mathematical Modeling of Biological Systems, Technical University of Munich (TUM). "What factors determine the ultimate cell type, for example, whether a skin cell is formed? And how does the number of cells of one type develop in an organ so that, for instance, our immune system has the right number of T-cells? As both these questions are directly connected, we set out to answer them within a global model." Such considerations are not new at the ICB. Using transcription, researchers at the Institute had already discovered how the formation of different types of blood cells from blood stem cells is regulated. 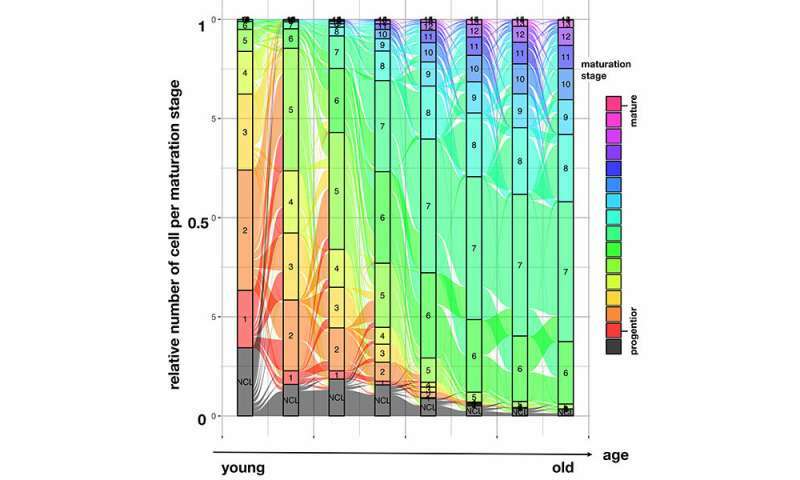 They developed an algorithm called Diffusion Pseudotime, which enabled them to reconstruct which genes are expressed consecutively and how the developmental trajectories of the different cell types branch off. Thanks to the new mathematical model, the interpretation of such results will be greatly simplified in future. "We developed pseudodynamics as a new mathematical model in order to simulate the cells' destiny," reports David Fischer from the ICB, who is together with Anna Fiedler the co-first author of the study. "In the process, we also consider factors such as the size of a cell population and the changes it undergoes in a time series. This allows us to estimate the selection pressure and formation of new cells as parameters and to predict the developmental status at new points in time," Fischer says. "With our model, we can determine how cell proliferation and death are regulated at different stages of the complete developmental cycle and how strong this control system really is." The research team, which included Prof. Theis, Dr. Jan Hasenauer (ICB), Prof. Heiko Lickert, Institute for Diabetes and Regeneration Research (IDR), Helmholtz Zentrum München, and Ph.D. Rene Maehr, UMASS Medical School, University of Massachusetts, as well as the first two authors, conducted pseudodynamic tests with T-cells (cells of the immune system) and beta cells (pancreatic cells). Their tool describes both the proliferation and apoptotic rates of the cells. If many beta cells die, this leads to type 1 diabetes. "Mechanisms that induce proliferation and death are often difficult to differentiate, based on current data," explains Theis. He sees pseudodynamics as "the first tool of basic research that will allow vital questions facing biology to be examined at the single-cell level."